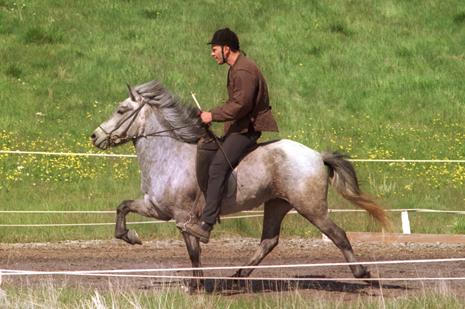 Helgi frá Neðri-Hrepp (8.31) is a very good five gaited stallion and a competition horse with extremely good gaits and spirit. Helgi is son of Keilir frá Miðsitju (8.63) and Gletta frá Neðri-Hrepp (8.36). 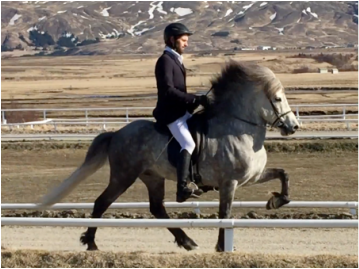 Helgi frá Neðri-Hrepp (8.31) is a first prize five gaited stallion and a competition horse, son of Keilir frá Miðsitju (8.63) and Gletta frá Neðri-Hrepp (8.36). 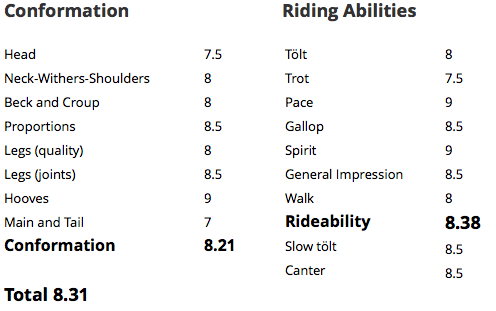 Helgi has 8.21 for Conformation and 8.38 for Rideability; 8 for tölt, 7.5 for trot, 9 for pace, 8.5 for gallop, 9 for spirit, 8.5 for general impression and 8.5 for walk. Helgi's highest score is 7.20 in Five-Gait (F1), 6.30 in Tölt T3, 6.23 in Four Gait V2 and 8.52 in A-Class (five-gait). Keilir frá Miðsitju (8.63) has 8.42 for Conformation and 8.77 for Ridden Abilities; 8.5 for tölt, 8 for trot, 9 for pace, 8.5 for gallop, 9 for spirit, 9.5 for general impression and 8 for walk. Keilir got 1. prize for his offsprings at Landsmót 2004 and honored for his offsprings at Landsmót 2006. 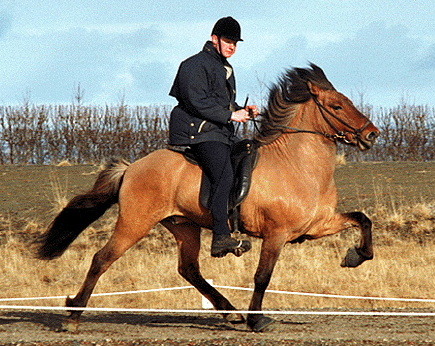 Gletta frá Neðri-Hrepp (8.36) has 7.61 for Conformation and 8.85 for Ridden Abilities; 8.5 for tölt, 9 for trot, 9.5 for pace, 8.5 for gallop, 9.5 for spirit, 8 for general impression and 9 for walk. Gletta has got eight offsprings and three of them has 1. price. 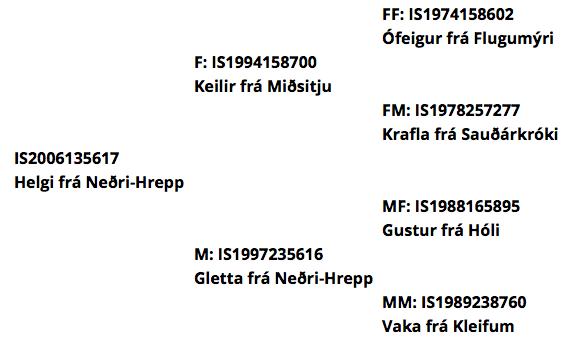 Gletta is daughter of Gustur frá Hóli (8.57) and Vaka frá Kleifum.